This article assumes that you already have some familiarity with using the naviextras Toolbox software, and that you have already installed the software on your PC. It also assumes that you have created a naviextras account. Further information on these topics is available in this knowledgebase. The HN6 has more internal memory than the HN5i. The HN5i will create content folders on the micro SD card to contain additional content which will not fit on the internal memory. Some of the packages are relatively large, but the software will display the size of the package when you are browsing the catalogue. Start the naviextras Toolbox software. If you have had the Toolbox software installed for a period of time, you may be notified that there is a new version available to download and install. You should always update the software to the latest version if there is one available. In the naviextras Toolbox program on your PC, click on the Maps button (this button may be labelled Shop. It depends on the language settings current in naviextras Toolbox). Browse the online shop until you find the content you wish to purchase (in this example we are going to purchase the Western Europe map set). Download and install the current latest version of the map. You are not entitled to any free updates once you have installed this package. Allows use of the downloaded map for a fixed period of 1 month. This can be a good option if you are going to visit a country for 2 weeks. Once you have chosen the package you want, click the ADD TO CART button to add the selected content to your shopping cart. You will see a status message indicating that you have successfully added the content to your shopping cart. The MY CART panel on the right will show the current contents of your cart. You can continue browsing the catalogue at this point, or click the GO TO CHECKOUT button to make your purchase of the existing cart contents. You will then see a summary of the contents of your cart. 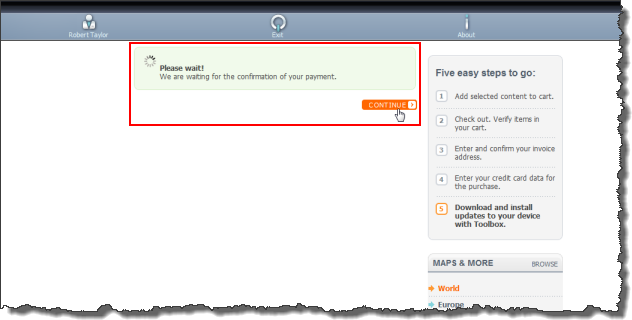 You will also now see a panel to the right which shows your current process through the purchase process. 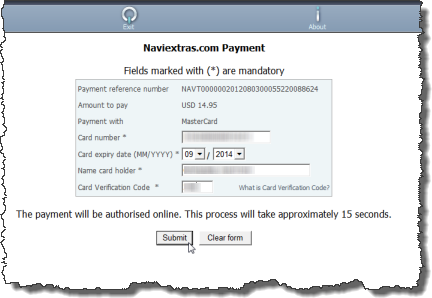 Click the INVOICE ADDRESS button to proceed to the next step. 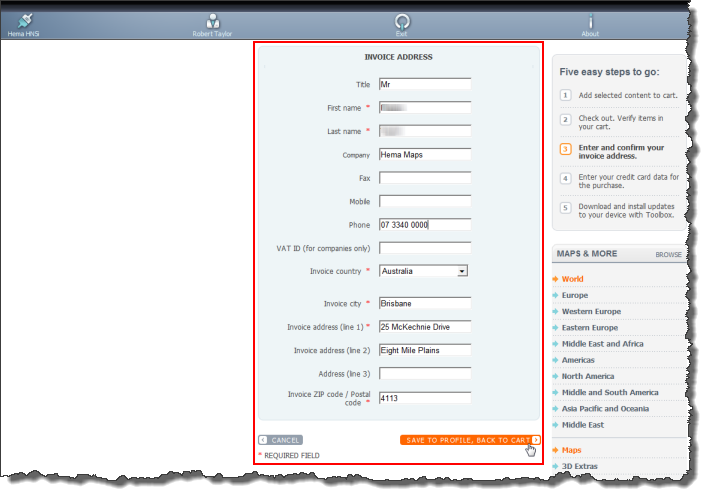 Specify the address used for your invoice. When paying via credit card, this is usually the same address as that used for your credit card statement etc. Once you have made a purchase the software will remember these details for your next purchase. Verify your details, and change them if necessary. 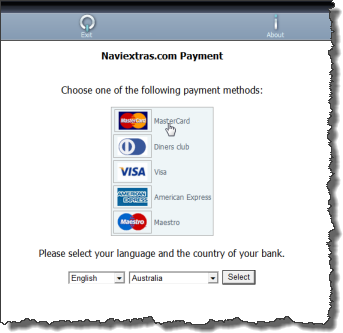 Choose your payment card type by clicking the appropriate symbol. 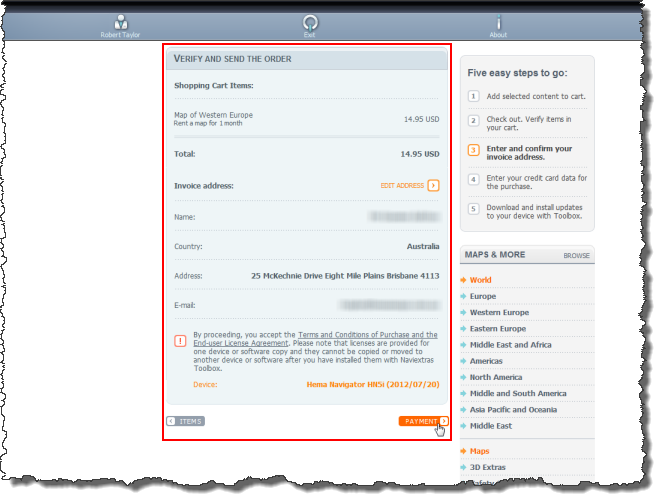 Once the payment has been processed, the packages you have purchased should start downloading to your device. If you have purchased a large package, or multiple packages, be patient! 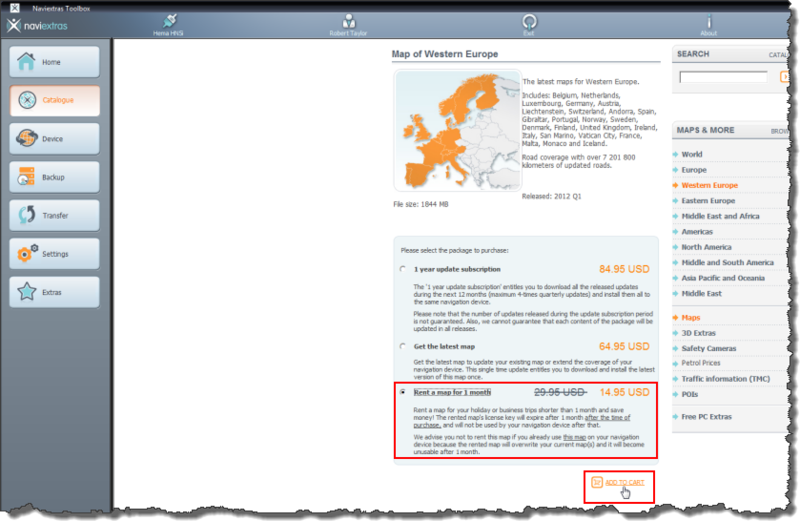 In our example, the Western Europe package took around 1.5 hours to download and transfer to the Navigator. The download time will be entirely dependent on the speed of your internet connection. If the download is interrupted, for example by an failure of your internet service, it should be able to be resumed after your connection is restored.